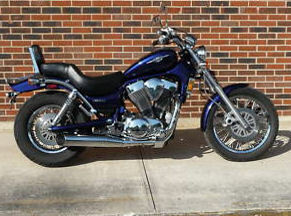 Thanks for stopping by look for a used Suzuki Intruder for sale or to sell your motorcycle in our classifieds. While you're here you can take a minute to check out the other Suzuki motorcycles for sale or to list any used Suzuki Intruder parts, accessories or gear for sale. After all, you won't be needing it if you're selling your bike, right? According to reviews that I have read, even the factory seat is reported to be comfortable, the bike maneuvers very well and the ride is smooth. often as we have new listings all the time! Before you buy, go HERE to see how the bike that you are considering stacks up to other bikes. Or use this form to submit your classified to sell your old Intruder. Some of my friends (die hard Harley lovers to the core) have told me that they have been looking for a Suzuki Intruder for their wives to ride because the height of the bike is right for a petite to average sized lady. Plus, the weight of the motorcycle is light enough for a female to handle even in heavy city traffic and when parking or at a stop light. But don't be fooled, this sporty little bike may appeal to women but it's not a weak, sissy kind of a motorcycle when it comes to performance. Reviews state that in spite of the fact that it's a lightweight, more compact motorcycle that it is powerful enough to carry two people easily with a combined weight of up to 350 pounds! All of these characteristics have increased the number of bikers that visit GoGoCycles Used Motorcycles for Sale shopping for a Suzuki Intruder for sale at a good price. So, if you have one of these used Suzuki motorcycles for sale now may be a great time to advertise it in our classifieds because bikers are out there looking for them!